Flickin' Chicken: Indoor/outdoor rubber chicken tossing game. Flickin' Chicken is an amazingly simple, yet insanely addictive rubber chicken-tossing game. And yes, it's probably the most ridiculous product to ever grace Vat19.com. 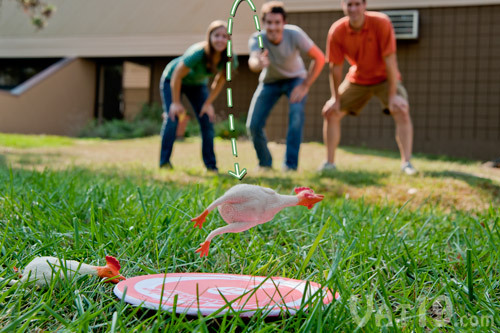 Your goal is to land your defeathered chicken onto the ten-inch target disc in as few throws as possible. Think it sounds easy? Think again. These barnyard fowl will bounce and roll unpredictably. Includes four rubber chickens, a 10" target disc, and a scoring pad with pencil. Flickin' Chicken can be played indoors or outdoors with 2-4 players. Ages 6+. The object of Flickin' Chicken is insanely simple: land your rubber chicken on the target disc in as few throws as possible. Actually performing this task is quite difficult. These frickin' rubber chickens aren't aerodynamic and they bounce like they have a mind of their own. Fling your chicken and hope it comes to rest on the target disc. 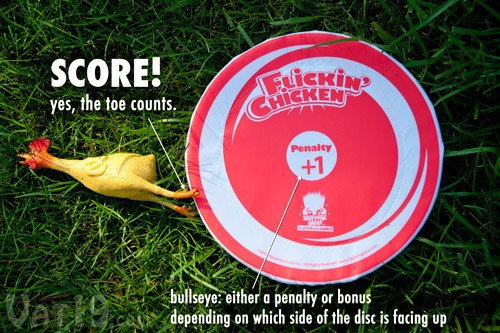 The Flickin' Chicken target disc is ten inches in diameter. At the beginning of each round, one player will toss it as far as they can. Players then take turns trying to land any part of their chicken on the disc. Toes, beaks, and wattles (that dangling flap of skin on their neck) all count. The scoring system is similar to golf. Any toss that misses the target disc counts for one point (similar to a "stroke" in golf). Continue tossing from where your chicken last landed until you land on the target. If you happen to land on the bullseye, you may either earn a penalty point or subtract one point from your score, depending on which side of the disc is facing up. The player with the lowest score after nine rounds wins. Your objective is to land any part of your flickin' chicken on the 10" target disc. Flickin' Chicken's rubber fowl have a tendency to bounce and roll quite unpredictably. However, with enough practice (and beer), you will learn to harness their unique projectile properties. 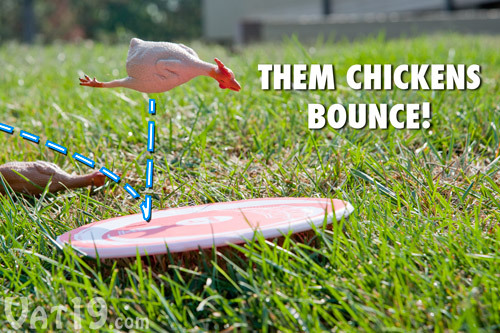 Master the rubber chicken's irregular bounce and you shall bask in glory at Chicken Stadium. Flickin' Chicken (aka the ultimate rubber chicken game) includes a 10" target disc, four rubber chickens, and a score pad with pencil. Your Flickin' Chicken box includes the target disc, four rubber chickens, and a score pad with pencil.